Qualcomm Snapdragon processors are mainly used in smartphones manufactured in high volume, and in the past if you contacted the company to use their processor for your custom project with a target yearly production of a few thousands pieces, they’d just ignore you. This started to change in late 2016 with the launch of Snapdragon 410E and 600E processors based on mobile version of Snapdragon 410 and 600 processors minus the modem, but instead targeting the embedded space and the Internet of Things, which anybody could purchase easily through Arrow Electronics, and offering a 10-year life cycle. Those are good if you are satisfied with entry-level or mid-range processor, but the company has now announced the launch of Snapdragon 820E for customers requiring better performance for their application. The company expects the processor to be used for Industrial IoT applications, digital signage, UAVs and robotics, smart glasses, and virtual/augmented reality headsets. There’s no mention of software support, but according to the press release, the long awaited 96Boards compliant DragonBoard 820c development board features Snapdragon 820E SoC, and based on recent info from 96Boards community, the board supports Linux (Debian, Open Embedded, Yocto Project) as well as Android. 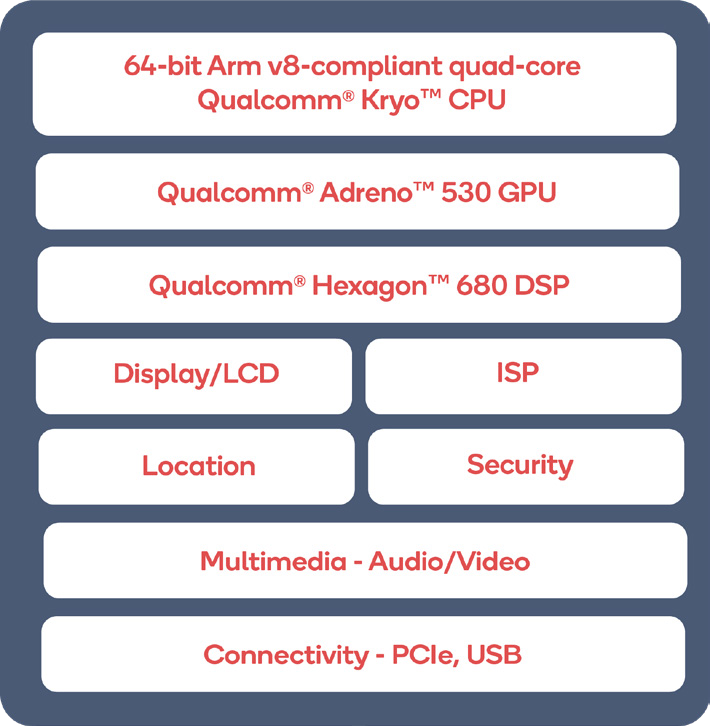 Snapdragon 820E SoC (they call it “embedded platform”) will be made available through Arrow Electronics and other distributors for 10 years from commercial sample (until 2025) together with the following companion chips for power management (PM8996/PMI8996 PMUs), audio (WCD9335 codec), and GPS & Glonass (WGR7640 RF Receiver). 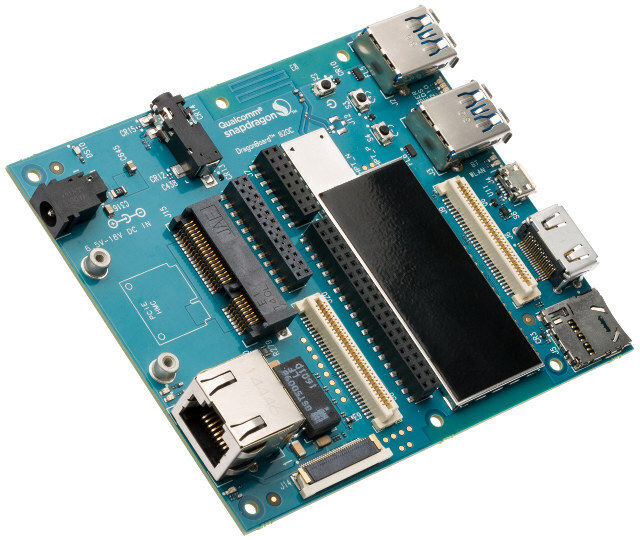 Arrow Electronics is also selling DragonBoard 820c development board to help end customers and ecosystem participants getting started with Snapdragon 820E embedded platform. Somehow there’s no price on Arrow website (quote request only), but based on DB820c page on 96Boards website, the price should be $199 for the “basic kit”. More details may be found on Qualcomm 820E’s product page, and developer website.